Ask fellow campers about "Dripping Springs RV Park" and nearby attractions. We stayed here mostly out of desperation. The other two nearby parks were booked up, so we were just happy that we found someplace to park our rig for a few days to visit our kids and granddaughter. I was a bit surprised that there were so few RV parks in the area, but that's for another time. Basically, we stayed on dirt, and did have hook-ups, and that was about it. As others have said, this is for long-termers who are working in the area. I think our 2014 motorhome was about the newest and in the best condition one there. We got caught in some rain and ended up in Texas mud which we still (a year later) haven't entirely gotten rid of on the underside of our Jeep Wrangler! But that's okay - it's proof we were there. Plus or minus - the park is right near an open space for cows and some get into the park if the gate is open for any length of time. Our dog found this terrifying even if we found it mostly amusing. They do amble a bit and make some big noises (poor puppy!) For us, it added to the rustic charm (ahem! ), but I can imagine others would feel it was a bit too rustic. Lastly, the owner who we only spoke to on the phone, was pleasant and there was a caretaker who lived there (again, we never actually saw him, but he lived right behind the laundry room.) We did not use any of the facilities as we were visiting nearby family, but we also didn't try and have any family visit us. To us, we were staying in the "cow pasture" - $40 a night is really rather high considering the state of the facilities and location. We camped at Dripping Springs RV Park in a Motorhome. You're in the Hill Country, so just go with being in the cow pasture and don't spend a bunch of time in your rig. Take your toad and enjoy the backroads and little towns of Wimberley, Dripping Springs and Driftwood. Especially fun is the Salt Lick Barbecue in Driftwood, Texas. You're also on the main road to Johnson City and Fredericksburg, wonderful Hill Country destinations. 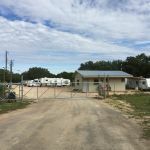 The point of this posting is to alert everyone that Dripping Springs RV Park is, for now, more of a trailer park -- permanent residents -- than an RV park catering to those who are just passing through. I went by Dec.23 to reserve a site for a visit in the spring. Said I wanted to stay a week or 10 days. Was told that wouldn't be long enough for them, that the park caters to long-term, permanent residents. Couldn't go in for a drive-through tour ... there is a locked gate with keypad access to the campground. From what I could see from the gate, the park was pretty full, sites looked (from a distance) level and comfortably close together, with not a whole lot of shade. Well-maintained by what I could see. We camped at Dripping Springs RV Park in a Motorhome. Website is deceptively modern and nice. This is a 'new' park as of summer 2015. It is already 1/2 full with 'permanent' residents. It is set in beautiful Texas Hill Country, but the park itself is not beautiful at all. Spaces are very narrow. Most are not level. Dirt drive and 'pads.' Cars parked willy-nilly throughout the small park. Free, but inconsistent internet (was out for the last few days we stayed). This park does not post rules, and as such, residents are free to hang out outside late into the evening enjoying themselves. Lots of dogs; lots of incessant barking while we were there. We are all for enjoyment, and we love dogs, but this impeded our ability to work and sleep. Owner/management is not onsite, but is very friendly over the phone. 20 minutes from conveniences of Dripping Springs, an hour outside of Austin. We left the park after a week and a half, choosing to 'eat' the money we paid in advance to stay a full month. No regrets about leaving, even with having to pay 'double fees' by staying elsewhere. There are many parks around Austin and/or Dripping Springs; avoid this place if at all possible. We camped at Dripping Springs RV Park in a Motorhome. Are you affiliated with Dripping Springs RV Park ?